Want to train Video Indexer to recognize people relevant specifically to your account? We have great news for you! Face detection and recognition are both very widely used insights that Video Indexer provides. The face recognition feature includes the ability to recognize around 1M celebrity faces out of the box and to train account level custom Person models to recognize non-celebrity people who are relevant to a customer’s specific organization. We received multiple requests from customers to further enhance the capabilities of custom Person models. Today, we are happy to announce a wealth of enhancements that makes custom Person model training and management faster and easier. These enhancements include a centralized custom Person model management page that allows you to create multiple models in your account. Each of these models can hold up to 1M different people. From this page, you can create new models and add new people to existing models. Here, you can also review, rename, and delete your models if needed. 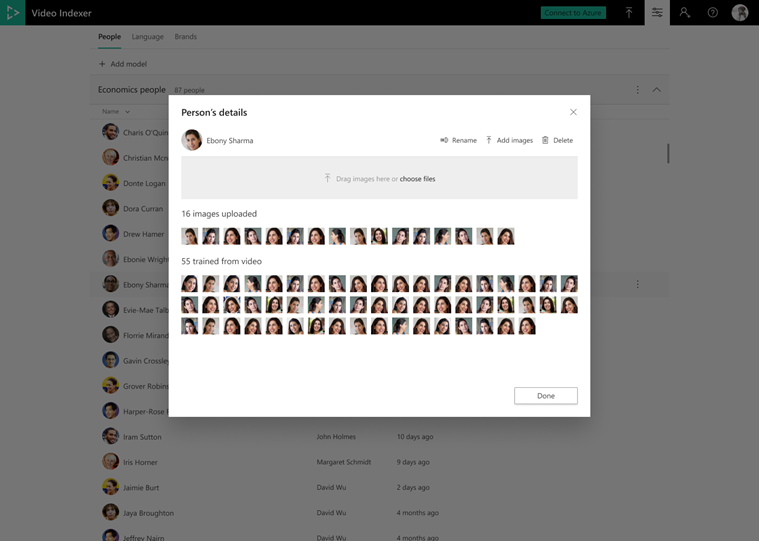 On top of that, you can now train your account to identify people based on images of people’s faces even before you upload any video to your account (public preview). For instance, organizations that already have an archive of people images can now leverage those archives to pre-train their models. 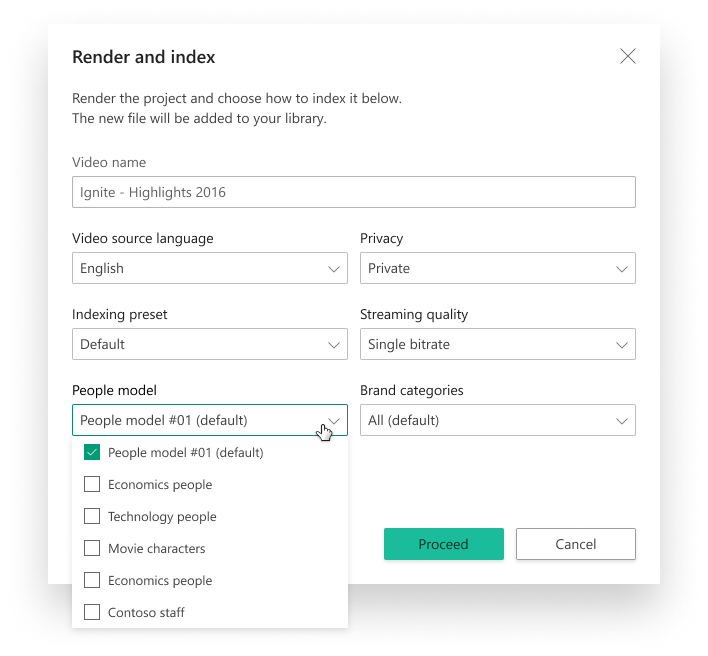 Video Indexer now supports up to 50 Persons models per account, and each of those models supports up to 1 million different people. If your Video Indexer account caters to different use-cases, you can benefit from being able to create multiple Person models in your account. For example, if the content in your account is meant to be sorted into different channels, you might want to have a separate Person model for each channel. You have the option to select the custom Person model that you want to use to index a video. This will determine which model Video Indexer you will use to identify people in the video and to update any new people tagged directly from the video. A new “People” tab has been added in the content model customization area of Video Indexer’s portal. This is a great place to centrally review and manage all the account’s custom Person models. Here, you can also add new Person models to your account and add new people to your existing models. 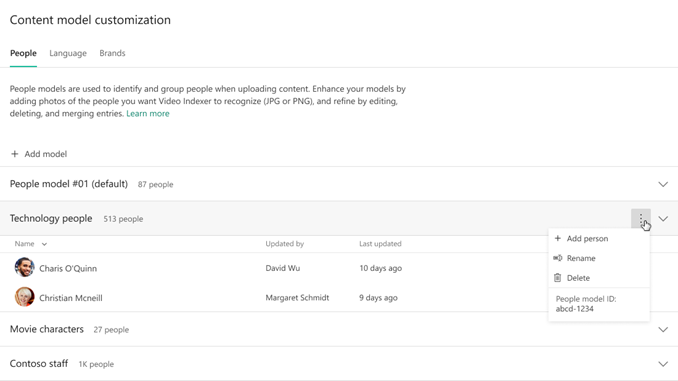 For videos that have not been indexed using a custom Person model, any tagged faces in the video will automatically appear in your ‘Default’ Person model. If you already have an archive of relevant face images, you can use these face images to train Person models in your account even before you’ve uploaded your first video! Simply drag and drop a set of images to the person entry in the content model customization page. Training from image is currently in public preview. Each person entry in the model can be managed separately. By clicking the “manage” action for a person you will see all the images that this persons model is trained from, either from videos or from images that you have manually uploaded. 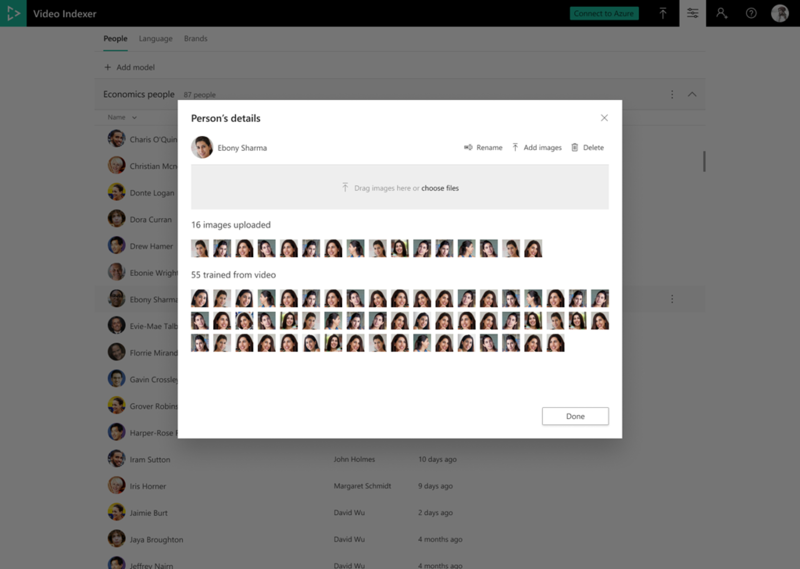 Within the “manage” action, you can also upload and delete face images for a person. The more face images that you add for a person generally means the better chances there are to get accurate recognition of that person. From time to time, users need to tag two different people with the same name. Video Indexer now allows users to add multiple people with the same name and is still capable of identifying each person separately. However, we still recommend having unique names for people for ease of use. As always, everything we offer in the Video Indexer portal is also available in Video Indexer’s API. This means that you can automate the face customization processes completely and add the same experiences to your own applications and infrastructure. Have questions or feedback? We would love to hear from you! Use our UserVoice to help us prioritize features, or email us with any questions.